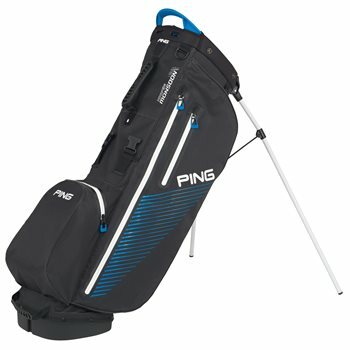 The Ping Hoofer Monsoon stand bag is lightweight at 5 pounds and features a 5-way top for organizing clubs and hi-tech waterproof construction that creates a barrier against the elements. The top includes a handle for lifting with ease and the easy-adjusting, sliding shoulder pads makes carrying the bag comfortable. The Hoofer Monsoon stand bag is equipped with a rain hood and six pockets that consist of four seam-sealed pockets (apparel, ball, valuables and accessories) and 2 concealed mesh slip pockets.